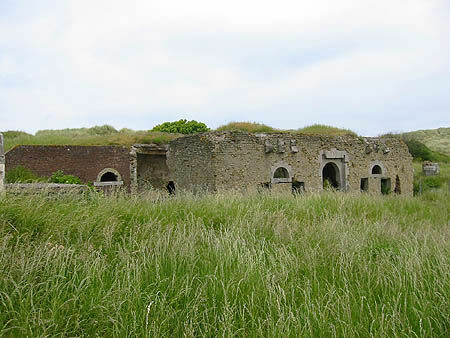 It is believed that the “Fort de lapins” was built in 1690 by the military engineer Vauban. It served as a redoubt*, an outwork on the shoreline north of Fort Nieulay, and formed part of Calais’ fortifications. These simple square-shaped stone-clad structures were equipped with 4 cannons and were guarded by a dozen men. However, they were not coastal batteries and so could not prevent enemy ships from coming within range of the city and the port. *A redoubt is a fort or system of fortifications usually consisting of a fortified defensive position outside a bigger fort (for example, Fort Nieulay in Calais). In 1860, a blockhouse surrounded by a ditch was built close to the Fort Lapin battery, the blockhouse alone being surrounded on three of its four sides by a narrow ditch. It formed part of Calais’ defences. It contained a guardhouse (for approximately 30 men) with a pediment bearing the inscription “1860”. The Fort Lapin battery was built according to the model devised by King Louis Philippe during a period of tension between France and England. Fort Lapin was one of the last to be built (in 1860) on the third model for a barracks with accommodation for a garrison of 30 soldiers. The building was later reinforced by additional structures required to modernise the battery in line with the successive military needs of the French and then the Germans. During the 20th century, the Fort Lapin battery evolved, playing an important role in resisting the advance of the 10th Panzer-Division in 1940 and then becoming a link in the famous Atlantic Wall. The pediment of one of the blockhouse’s entrances was reinforced and cemented in 1941. And now, efforts to reconstruct all the site’s defences are hampered by the encroaching dunes. There is no review about Le Fort Lapin, be the first to leave one !